Saints utility Lewis Charnock has joined Leigh Centurions on a one month’s loan deal. The 21-year-old has made six appearances for his Super League club, scoring two tries and kicking eight goals. Last season he also played eight games on dual registration with Rochdale Hornets in Championship One. 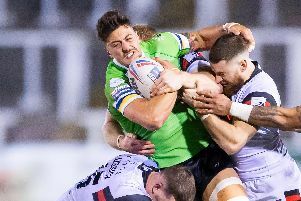 Saints Chief Executive Mike Rush said: “It’s clear that Dougie needs to be playing week in week out and although the reserves competition offers him chance to play at a higher level, moving to Leigh on loan will see him play more regularly and consistently. “Dougie is a hard working player and deserves the opportunity to gain more game time. Leigh Centurions Head Coach Neil Jukes added: “I’d like to thank Mike Rush, Keiron Cunningham, Tommy Martyn and everyone at St Helens for their assistance in a deal that should hopefully benefit all parties. “Lewis comes from a good culture and I look forward to working with him. He will add strength in depth across the board and will also enhance our kicking game. “He comes highly recommended and it’s important that people we recruit to our Club are good people. Whether you are 21 or 31 if you have a good attitude that’s important.